Many thanks to Shirley Rush Health Facilitator at Belfast Health and Social Care Trust for this great blog about using TM as a ‘weigh to health’. Following my Talking Mats (TM) training I had the opportunity, as a health facilitator, to use TM in an adapted ‘Weigh to Health’ course. 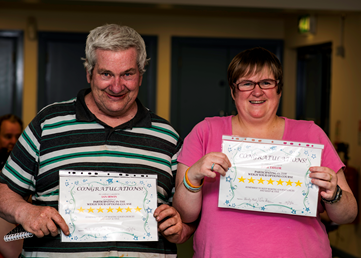 This course encouraged people with learning disabilities to make small changes to their lifestyle and to educate them on the effects of obesity and their health. Prior to commencing the group work we met with each person and completed a Talking Mat. The topic was to explore “Important things to lose weight”, we used a wide range of symbols and included physical activity, health conditions and appearance. Clients also requested additional symbols were added including alcohol, cycling and mood, which made the mat individual to them. A photograph was taken of the completed TM to act as a record of what was important to them. On completion of the group the TM was repeated with each person using the same topic and symbols and the mat was again photographed. When we compared the TMs it showed that all the client’s knowledge and understanding of the effects of obesity and the health benefits associated with weight loss had increased. The use of the talking mat was a valuable resource, it allowed each client to make an informed choice about participating in the group work. One client said he felt he had been listened too and “it done me good, helped me to lose weight by talking about my health and the need to lose weight to look after my heart”. By using TM in this way we have been able to use this information to demonstrate outcomes and it shows the information was presented at a level of understanding suitable for the client group. On an easy read questionnaire about the course all the clients agreed that doing the TM was useful, one person wrote “loved doing the mat”. 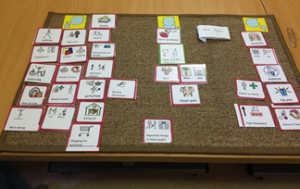 This entry was posted in Blog, Eating and drinking, Learning disability, Personalisation, Self management and tagged Eating and Drinking, Learning Disability, Personalisation, Talking Mats on January 5, 2017 by Joan Murphy.